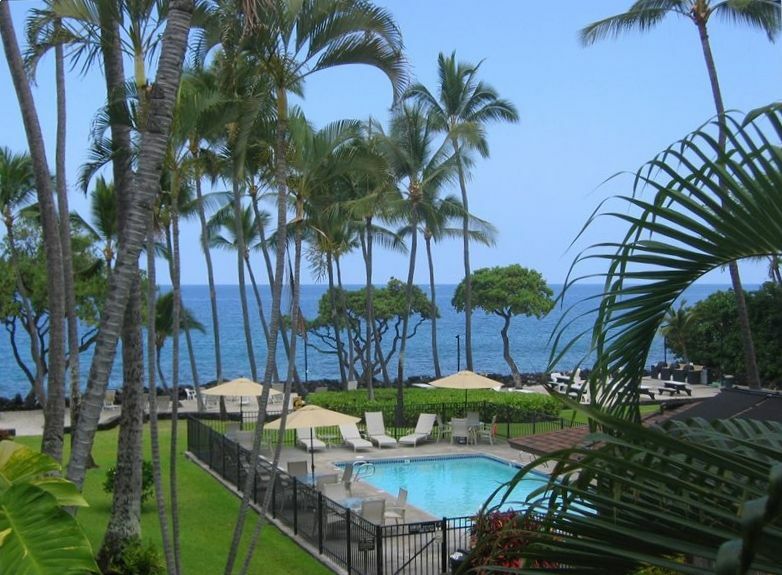 Kona Isle is a quiet condominium complex that is on the ocean just off of Ali'i Drive. A short 2-3 mile walk or drive south of Kailua-Kona. Our particular condo is overlooking a beautifully maintained garden/courtyard with views of the ocean and pool. There is a friendly gathering area for all guests of Kona Isle to use right on the ocean shore that has picnic tables, reclining lawn chairs, gas BBQs, and of course, the most spectacular sunsets. The condo is on the 2nd floor and is an end unit. It contains most amenities that you will need to make your stay enjoyable. One bedroom with a kingsize bed and a pull-out sleeper sofa. We fell in love with the Hawaiian islands after our first visit to Kailua-Kona. We made the trek from the deep freeze of Canada to visit family and wished that we never had to leave. After many trips back to Kona, we made the decision to buy a little piece of it. Now we can make a trip out every so often, and when we are not in our condo, we open it up so that others can enjoy our little piece of paradise. We chose to buy a place in Kona Isle because it was such a nice quiet and relaxing place to be. Even though it is off the main street running through Kona you would never know it. The sounds of the waves washing against the beach as you drift off to sleep certainly doesn't hurt either! Some of the things that we enjoy while visiting our condo is the very quiet setting that it provides. Being able to sit on the lanai, enjoy some world famous Kona coffee, and take in the beautiful view and sound of the ocean. Having a romantic dinner on the beach as the sun sinks into the ocean or having friends over and using the BBQ on the beach and cracking open a few cold drinks in the hot Hawaiian sun. The list is almost endless. You need to visit to see for yourself. Full bathroom. walk in shower, toilet and sink. Enjoy your morning coffee or a sunset dinner on the lanai and take the beautiful view of the ocean in. Telephone service is provided at no additional cost. Local calls only. Air conditioner located in living room. Two sets of linens for both the king sized and pull out sleeper are available. As well, there are towels, facecloths, beach towels, dish towels provided. Washer is within the condo unit. One assigned parking stall for condo. There are several fitness centers located within a 15 minute drive from the condo (The Club on Palani Drive is just one example.). Many people use Alii Drive as a walking/running path. Full compliment of dishes, utensils. As fully stocked as our imaginations allowed us. Should have all the basics for cooking and dining. Small round dining room table with 4 chairs. Nearby tennis courts. Not on Kona Isle property. Keauhou Golf and Country Club nearby. There is not an elevator in the condo complex. There is a heated swimming pool at Kona Isle for all guests to enjoy. Very nice property, right by the ocean, sound of the waves and views were tremendous. Would go back! The surrounding property was immaculate. Friendly residents made the nightly sunset gatherings so much fun. The condo itself was well equipped and very comfortable. I would recommend it to anyone. We have stayed in this unit several times and the owner has recently made some improvements such as walk-in shower and new furniture. There are still some areas needing repair and hopefully the property managers will see to these problems with the sliding screen and deteriorating wallboard. Nice view of ocean. Since I try and always be a positive person, let's start with the good things about this condo. Good view, comfortable bed, A/C works great. That's about where it ends. I am a frequent visitor to Kona and have been staying at Kona Isle for about four years now. Unfortunately, I was unable to book one of the regular units I lease as they were occupied by their owners/other guests at the time. I also do not like ground floor units and that is what led me here. Like a previous reviewer, I too was concerned about the lack of a secure front door which I thought might have been addressed, but had not. This condo is VERY tired. Not much renovation since they were built in the seventies. The cement wall behind the TV was crumbling away, the carpets were warn and dirty, the front of the washer&dryer unit was falling off and required you to turn on large water valves over the sink. The photo's posted cleverly do not show these items. Unlike most other units (I have lease 2 others regularly and have visited in about 4 more), no dishwasher and old, outdated vertical blinds with broken parts. We never were able to fully close them to block out the afternoon sun. This unit clearly has a "hands off" owner. The leasing agent is just that. In addition, the price of leasing this unit is just as high as others in much better condition, some with oceanfront views. The difference is, they are well tended by their owners who show a real interest in them. Sadly, I cannot recommend this unit. The security of the entrance doorway is in the process of being attended to with the addition of a deadbolt. The "crumbling" drywall adjacent to the lanai sliding doors is also slated for repairs over the slower summer months. The condo unit was also renovated when we bought it with new tile flooring, paint, new furnishings, new sliding lanai doors, vertical blinds, etc. We would have loved to renovate further but it wasn't feasible at the time. There wasn't any "clever photography". We took pictures to show the layout of the condo and its beautiful views. We are not "hands off" owners and do what we can to make guests stay as nice as possible. What was not mentioned was the incredibly well stocked kitchen, in which we have had many compliments. The cleanliness of everything, nice furnishings. The taps to turn the water on and off to the washing machine are hardly an eyesore or an imposition. My wife and I stayed there a couple of months ago and took stock of the condition of the condo. The carpets are in need of updating but were not dirty. The bathroom also needs to be updated. The vertical blinds were fully functional as well, so we will look into that concern. My sister and I had a wonderful time at your place. We loved falling asleep to the sound of the waves, breakfast on the lanai with a beautiful view of the ocean. It was convenient to town. I would stay again. Thanks! This place was fairly nice - very central to restaurants, beaches and shopping. The place was a bit "elderly" although some updates are apparent. The condo door has no deadbolt - nothing other than the twist and turn handle lock. The bathroom had a urinal smell to it and the tub had a section where water pooled after a shower. The kitchen lacked some of the basics such as a teapot and a spatula. The pool and beach area was nice. Neighbors were friendly! We enjoyed a Christmas Eve get together on the beach. This was a great location, and the condo was perfect. Great views from the condo, the grounds here are immaculate, great pool. The bbq area on the beach is unbelievable! Fresh grilled fish and mai tais on the beach watching the sunset---does it get any better than this? We would definitely come back to this place, to this condo. A wonderful home base.